Hello fellow writers and readers. This is my first post and my first blog-writing experience. I’m starting a blog because I’ve spent years writing short stories and poetry, and have recently published my first book, a memoir called A Wind from the East. 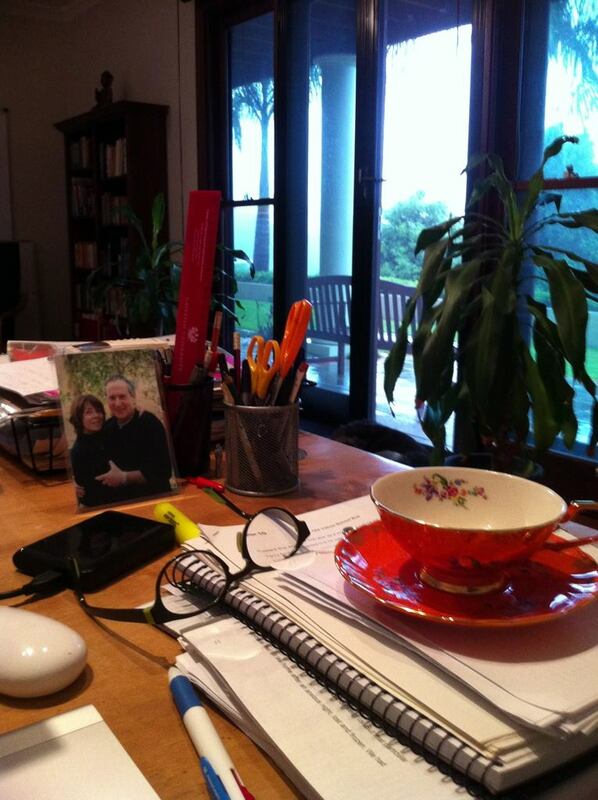 I took the above photo one wet day when I was writing the final chapter. For me, the picture contains much of the essence of that time, spending days alone with words and memories. South-East Queensland’s sub-tropical rain had been plummeting for hours on the hillsides around my house, high winds were tossing palm trees outside the windows, the storms held me more firmly than usual at my desk. I hope to share the writing life with you. Poetry that I love, other writers, and chats about the content of my memoir, which is a story of love, loss and finding strength from within. Writing helped me get through grief and loss. I’m also a writing group facilitator. Once a month, I run a writing group in Brisbane, Queensland for vision impaired people—Writing With A Vision. It’s no different to a writing group for sighted people, except we have no use for picture prompts. We use phrases, sentences, single words, songs, poems, smells, and objects to feel as prompts for our writing. I hope to share some of our activities on this blog. Writing exercises are useful as inspiration, they act as triggers for memories and imagination for those who write solo, or in groups. They are great for making that thing called ‘writers block’ a myth. Writing spontaneously from a prompt can make the unexpected appear on the page.